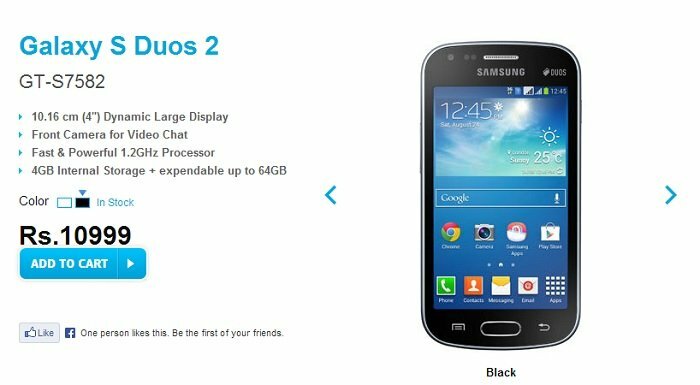 Recently, the Korean OEM posted Samsung Galaxy S Duos 2 (GT-S7582) on Samsung India’s website with a price tag of Rs. 10,999, which is equal to almost $175. Samsung has yet to make an official announcement about the launch of the successor of the affordable Galaxy S Duos smartphone. The handset comes with dual-SIM capabilities and runs Android 4.2.2 Jelly Bean out of the box. According to the product page on Samsung India’s website, the smartphone weighs just 118g and packs a 4-inch WVGA display sporting a resolution of 480 x 800 pixels with a 1.2GHz dual-core processor and 768MB RAM. On the storage side, it comes with 4GB memory on board, with an option to expand it via a microSD card of up to 64GB. On the rear, the handset comes with a 5MP camera capable of HD video recording with a VGA front-facing cameras. Other features include WiFi, Bluetooth, 1,500 mAh battery capable of providing talk time of up to 8 hours, dual-SIM support and runs Android 4.2 Jelly Bean out of the box. Many of you may consider the $175 price tag to be a little high, especially the ones residing in the US as they can already get the Moto G in this price range, which features a quad-core processor and HD display.